Milwaukee<sup></sup> Torque Lock Locking Tools provide faster tool setup and more locking force for the professional tradesmen. The patent pending thumb screw provides the user with a more convenient geometry for hand force, while providing clearance to generate more torque with the unique screwdriver through-hole design. Featuring hardened jaws for more gripping power, and forged alloy steel for maximum durability Milwaukee<sup></sup> locking tools are made for the toughest jobsite. Milwaukee<sup></sup> stands behind their product and offers a Limited Lifetime Warranty with all locking tools. The Crescent X2 Long Reach Pliers contain a compound joint allows access with minimal handle movement. Jaws open greater distance than the handle for added reach in tight locations. Extends pliers where others cannot go. Contains: 13 in. Long nose pliers. Use the DEWALT 8-in. Push-Lock Pliers for your next home improvement project. 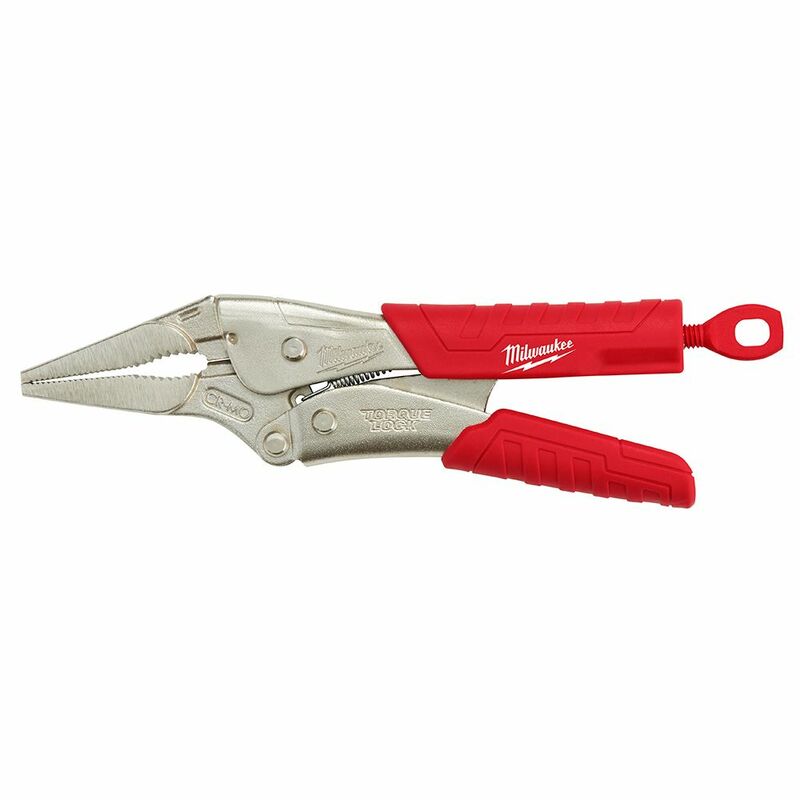 The pliers feature Push-Lock technology with 17 locking positions for easy jaw adjustment. The jaws are constructed from induction heat treated steel. They provide a hands free operation. They are used as a clamp to hold two pieces of material together until they are permanently joined, to hold materials for welding, etc. The locking device also makes it easy to hold odd shaped objects. They are a must have for any professional or D0-It-Yourselfer. 9 In. Torque Lock Long Nose Locking Pliers With Durable Grip Milwaukee<sup></sup> Torque Lock Locking Tools provide faster tool setup and more locking force for the professional tradesmen. The patent pending thumb screw provides the user with a more convenient geometry for hand force, while providing clearance to generate more torque with the unique screwdriver through-hole design. Featuring hardened jaws for more gripping power, and forged alloy steel for maximum durability Milwaukee<sup></sup> locking tools are made for the toughest jobsite. Milwaukee<sup></sup> stands behind their product and offers a Limited Lifetime Warranty with all locking tools. 9 In. Torque Lock Long Nose Locking Pliers With Durable Grip is rated 4.5 out of 5 by 59. Rated 4 out of 5 by Nicho from Worked great.... Worked great. Rated 5 out of 5 by HomeDepotCustomer from Super comfortable to use. ... Super comfortable to use.